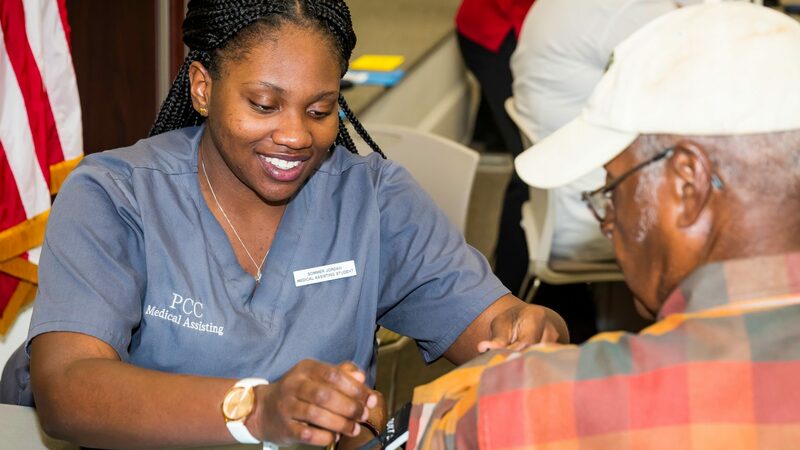 WINTERVILLE—The Pitt Community College Health Sciences Division held its annual health fair April 10 to give members of the community a chance to gain valuable health information and see firsthand the college’s efforts to develop skilled health care professionals. Event organizers say nearly 500 people attended the 4th Annual PCC Health Fair, surpassing last year’s record attendance by a wide margin. One attendee, according to PCC Health Information Technology Instructor/Clinical Coordinator Tami Flynn, had “nothing but wonderful things to say” about the fair, which took place in the Craig F. Goess Student Center. Flynn said the woman explained that she is able to get a general idea of her current health status by participating in basic health screenings and visiting booths and displays during the fair. The information she gains also helps her determine when it’s time to make an appointment with a health care provider. PCC Health Sciences Dean Donna Neal says the fair serves as a tremendous opportunity for students to practice the things they’ve learned in their programs of study as they interact with attendees. Seven of the college’s health sciences programs – medical assisting, nursing, polysomnography, respiratory therapy, HIT, emergency medical science, and occupational therapy assistant – offered services during this year’s event, and health sciences admissions personnel were on hand to answer questions about programs. In addition to PCC representatives, 23 vendors from the community also participated in the fair, including Vidant Medical Center, Pitt County Coalition on Substance Abuse, and the Pitt County Health Department. East Carolina University’s School of Dentistry also took part, offering free dental screenings and supplies, and MyEyeDr. provided free vision screenings.